A couple of weeks ago I signed up for a demonstration held at my school The Institute of Culinary Education (ICE). Daisy Martinez of PBS's "Daisy Cooks" and "Viva Daisy" on the Food Network, was to provide a tasty, flavorful demonstration titled "Daisy Martinez Cooks Tapas!" and I was going! Today Daisy was going to tickle our taste buds with a tasting of Shrimp with Garlic Sauce, Bunuelos de Queso (cheese puffs), Serrano Ham and Chicken Croquettes, and my FAVORITE "Wrinkled Potatoes" with Spicy Mojo! First I must say, it was difficult trying to control ourselves--and yes, I am speaking for the entire audience--all 40 something of us. The air was filled with traces of garlic, cayenne pepper, shrimp and warm spices that sizzled in her pans. As Daisy prepared each dish, she graciously entertained us with stories of her home, her family and her love of cooking. Daisy proved to be very down to earth, comfortable in her own skin and confident in her cooking style--and with very good reason! Each sampling was packed with flavor and with each bite you could taste a bit of the love Daisy puts into her cooking. It was very apparent that she truly loves what she does, nothing complicated, just down right good food. It was a privilege to be there, to have her cook for us and to listen to her tell us about her real self as if we were friends of hers rather than audience members. After it was done, she kindly signed autographs of her book. I actually purchased Daisy Cooks! when it first came out, but didn't think of carrying it with me, instead she signed my folder. It was fantastic to witness a female chef in her element, equally graceful and modest. Thank you Daisy for a wonderful time! It's pretty cool when the person others see isn't who you really are. By day I work as an administrative assistant at an accounting office. Been this way for the last ten years. During the evenings I--like Batman, Spiderman and the all time classic--Superman--have a secret identity which pretty much sums up who I really am 24/7--a Chef. In March 2008 I graduated from the Institute of Culinary Education after completing my externship at Le Bernardin. As of Sept 2008 I became a chef instructor at Rustico Cooking in Midtown Manhattan. 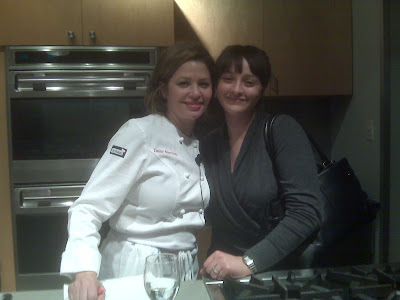 Here, a close knit of us teach hands on cooking classes to corporate and private parties. I also serve as a chef's assistant and instructor at Camaje--a bistro in downtown Manhattan offering cooking classes during operating hours of its restaurant. As if this isn't enough, I also teach children ranging from 4 to 13 years of age at the Young Chefs Academy in Forest Hills. Aside from this, I do freelance catering at Hudson Yards Catering in NYC. Okay, so perhaps my schedule is a bit intense, but whose isn't. Plus, when you really love what you do it doesn't feel like work, it's just who you are....even if the truth remains a bit of a secret to some. Admit it, wasn't half the fun behind Clark Kent was knowing that underneath those dark bulky glasses lied a super hero.